We have a winner for my Where's Seymour contest. Jen correctly identified the Space Needle as my location in June. For being the first correct answer chosen at random, she wins a RedWeek.com membership. Congratulations Jen, and thank you to everyone who submitted an answer. Be sure to check out the new Where's Seymour contest for July. 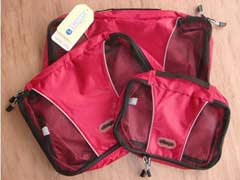 This month's prize is this great 3 piece set of packing cubes by eBags (a $29.99 value). Any serious traveler has to have these things. Good luck!